‘I don’t advise a haircut man. All hairdressers are in the employment of the government. Hair are your aerials. They pick up signals from the cosmos and transmit them directly into your brain. This is the reason bald headed men are uptight! Picture the scene…..the doorbell rings and a really nice friendly lady enters the house. My 4 year old son has been prepared for the arrival of the lady hairdresser and his behaviour has convinced me that this new method of haircuts I am trying might actually work! She chats away to us all as she gets out the tools of her trade. Dad, younger brother (1 year old) and J all ‘need’ a haircut. J says he wants dad to go first and then he will have his turn second. He seems happy and yet quite disinterested whilst Dad gets his hair cut. However, when it’s his turn he says he wants his younger brother to go next. T with his small wisps of fine hair has what little hair he has snipped off! I imagine him thinking ‘Why is this woman not looking at me and yet keeps getting so close to my face? Finally it is J’s turn and he comes up with every excuse not to sit on that chair. Something resembling a slapstick comedy scene ensues with me chasing my son around the house whilst he point blank refuses to come downstairs and get his hair cut –just needed Benny Hill music and the scene would have been complete. The lady hairdresser is obviously uncomfortable with cutting the hair of a screaming red-faced banshee/devil child and so I suggest that perhaps it wasn’t going to work and that we could try again another time. She leaves the house visibly relieved but happy with a payment for Dad’s & T’ haircuts and probably planning to be very busy if I ever rang back again for another go. Whilst I can now see the funny side of my hair and nail cutting antics with J, it was very traumatic at the time. Sometimes the screaming and the tantrums would be so loud I was surprised that social services did not turn up on the doorstep from neighbourhood reports of child beating. I would have to physically hold him whilst chopping at the hair. 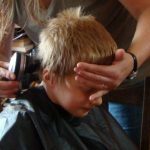 The build up to haircuts for us all were very stressful and my husband could not bear watching the scene unfold. I started to only do them when he was not around -to save him the stress of watching. I ended up with a barely acceptable routine and a terrible feeling of guilt. Now I realise about his tactile defensiveness, noise sensitivity, inability to sit still – the list goes on, all related to his integrated reflexes. 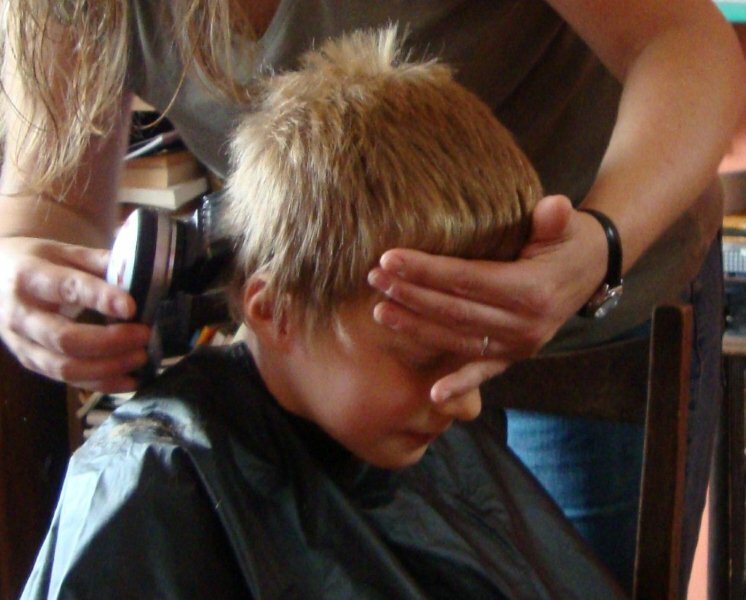 So, for some children, hair really does act like their ‘aerials’ and cutting hair can be distressing if their head feels lighter afterwards, they seem to perceive the pain of the hair being cut and they just lack the ability to sit still. Finally when the last bits are done he jumps in the shower to wash away any hair that has got on his body. I shout downstairs for next sons turn and grin to myself about how things have changed with no more haircutting difficulties.